Residential land surveys are among the most common surveys and are the type most likely to be encountered by the general public. Residential land surveying involves the precise measurements of the boundaries of a property. Someimes called a boundary survey land surveys may be used in the case of property disputes or before you build on the land. There is more to residential land surveying than simply measuring the boundaries of the land according to the title of record. Land surveyors will research and then plot the true boundaries of the property. So, step one of a land survey involves a search for any records concerning the property. Then, the land surveyor researches past surveys, easements, and other records which may influence his findings. Then, the land surveyor will take measurements of your land to ensure the physical boundaries don’t conflict with the boundaries recorded in records or past surveys. Various locations are marked, usually using stakes, to make future surveys easier. 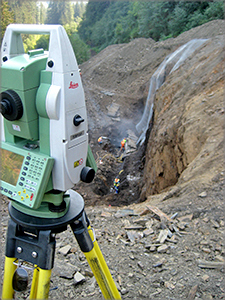 Actual measurements are made utilizing modern total stations. Today, GPS may also be used for land surveys. A land surveyor will measure each location multiple times, averaging these results to determine the true position of the point. The location of boundaries and easements will then be marked on your land. After the measurements are complete and have been marked on your land, the land surveyor will generally walk the property with you, pointing out the landmarks measuring each point, such as a plastic or metal stake and discuss any potential boundary conflicts. When a professional land survey is complete, the property lines as stated by the licensed surveyor become the legal boundaries of the property. In some situations, neighboring properties may need to have a residential land survey conducted as well, if there is a boundary dispute. Having your property surveyed by a residential land surveyor can provide peace of mind as you gain certainty about the exact boundaries of your property.